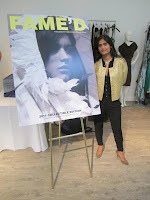 This last six month I have been excited to stumble upon several new fashion designers in Vancouver. Having the chance to turn a spot light on these talented artists is a pleasure like no other. I have interviewed several famous individuals inside and outside the fashion community and loved every minute, but I am often just one of many writing on them. When I find someone at the beginning of their career that shows incredible talent, it's like opening a Christmas present. Here is part one of five blogs on these talented artists presented in the order in which I met them. I originally noticed Mita's work about a year ago when there was an article on Lotus Eye in the Vancouver Sun. Some time after that article, she and I began an email dialog about the difficulties diverse designers experienced while trying to acquire coverage in mainstream media. I agreed, but couldn't guarantee anything. What she didn't know was I had been looking to find a designer creating a new direction in Indian garments for several years - something contemporary and cutting edge that would fit in Fame'd Magazine. My daughter had modeled Indian fashions for several years, so I knew what I was looking for. Early this year, I made the trek out to Surrey with another fashion writer to check out Lotus Eye and it took my breath away. The saris were my first surprise. Gone was the heavy beading and over abundance of sequins. In it's place were unusual prints and woven patterns that she designed herself. Many of the saris were classy, elegant and oh so subtle, something I had honestly never seen. 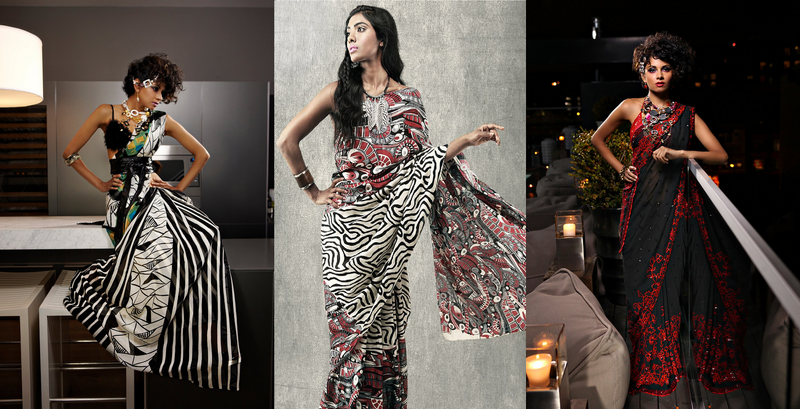 The show-stoppers caught your attention by having a truly striking and unusual print and/or vibrant colours. The lack of that heavy pile of shiny decorations created a sari that was much more versatile in where it could be worn and she took it one step further by tying them in completely new and original ways while adding Japanese Obi Belts and western jewellery as accents. That was it - she had to be in our magazine and I was determined to do the interview. In April 2011 I headed back out to interview her in depth. Naidu was actually a professional dancer, both a Bharata Ntayam soloist who performed at the Vancouver Olympics as well as modern dancer working with renown choreographers such as Judith Marcuse. When knee injuries ended her career, she needed a creative outlet and much to her parent's dismay turned to fashion. Ultimately she wanted to create a collection that would offer her social grouping contemporary options that would take them from an Indian event out to the nightclub - NOT fusion wear, a new and modern direction. Ultimately, she created a collection that has appeal across a wide cultural spectrum. The opera crowd has particularly taken notice. Naidu flew to India that first time with her family's backing and spent several months creating the inaugural Lotus Eye collection. To get the best product, the designer had to visit several areas, each with their own specialty. 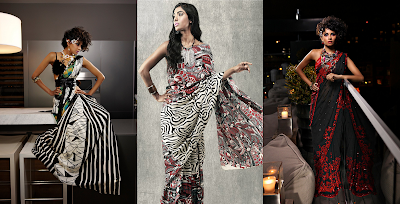 Patterns, colours and weaves were designed by Naidu personally at the mills that produced the fabric. As what she does it outside the norm, she often has to sit right beside the production team, fighting to make sure the neckline was just so, the weaving done as specified, etc. It was time consuming to push the envelope, but the end result made it all worthwhile. Traditional elements were showcased in new ways, necklines were lower or in new shapes and unique fabrics for saris abounded. The final collection included Lenghas, Suit, Kaftans, Kurtas and a wide variety of separates in an extensive palette. Since that first collection, Lotus Eye has been steadily growing. The second collection included many new elements such as a capsule collection of menswear and a new style Linga with a Gypsy influence - 24 metres of dip-dyed cotton with very little glittery embelishment. 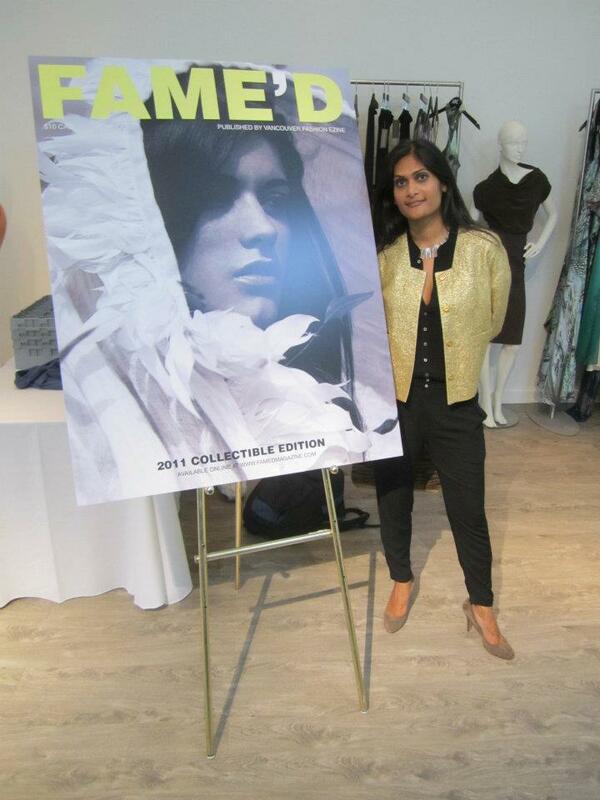 Naidu was also featured in the May 2011 edition of Vancouver Fashion eZine - click HERE - as well as the 2011 print collectible issued under the new Fame'd Magazine label. There is no doubt that the future looks bright for this talented artist and I am looking forward to soon including one of her amazing garments in my wardrobe. I just haven't been able to decide which!!! For more information and photos please visit the Lotus Eye Facebook page at www.facebook.com/lotuseye1.